Bonjour personnes! How did you spend your weekend? Any new stories? Do share with me (gossip is what I like!). Here at Room n House we are back with another exciting theme and some amazing articles for our readers. After talking a lot about travel and stuff in the previous weeks, this week we will be sharing with you all, what travel is, for us. I hope you all are familiar with this theme, if not then go and read Sonali’s post (after reading this one) and also discover what travel is for her. Shopping! Shopping! Shopping! is what travel means to me. Exploring new markets, collecting new stuff and buying products from all over the world is what that fascinates me the most. Though brands attract me but the local markets have something special in them. Be it my hometown’s local market or that of Bangkok, if I am on my shopping spree than no one can stop me. 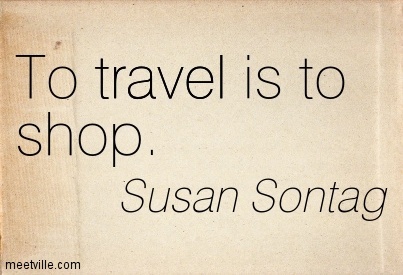 My definition of traveling is shopping as I travel to shop around the world. Be it designer handbags or local clothes I love collecting stuff from different places. Not only does this give me variety in my wardrobe but reminds me of the moments I have lived with the people who are special to me. Today’s post is for that little girl inside me who loves to shop and for all the girls out there who think that shopping is their life. P.S for once we can live without water but not without shopping. P.S this is so much fun and you should definitely try it. Shopping is not the only motive for which I travel, there are many more (you will have to read my next post to find out what they are). Travel has a very important place in our hearts as our journeys has always given us something special to cherish. With this travel celebration, this post comes to an end.